Fairland Cafe, Wichita. Photo by Scott Phillips, c. 1980. 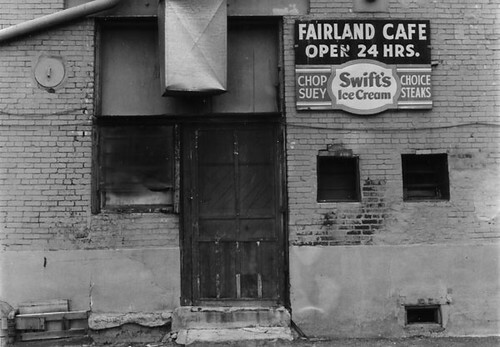 Back in the 50s or 60s, there was a place near the newspaper and the police station called the Fairland Cafe— a 24-hour diner/chop suey joint— and one night a gangster got tipped off that somebody planned to bump him off; he hightailed it to the Fairland and set himself up in a back booth, drinking coffee for two or three days as the would-be killers sat in the parking lot waiting for him to come out. By the last day he was smelling so bad he had to toss $50 bills at the waitresses to get them to bring him more coffee. Finally the standoff ended when he had a heart attack and left the restaurant in an ambulance, the assassins watching helplessly as he was carried out of their reach. Even less logically, the presumed hygiene of such a place—which never closes long enough for a really thorough cleaning— bugs me more in Chicago then it ever did in Wichita. There’s no sense to this at all, it’s not like we didn’t have germs there too, but what can I say; the tattered, rundown place that seems charming on Kellogg in my hometown seems a little squicky to me on Western or Pulaski. I should point out that most of the time, there’s no factual basis for this; the paneling may be chipped, the counter may be stained, but I have no reason to think the place doesn’t meet basic hygiene standards. But the dilapidation just nags at my subconscious in a way the same basic place in Wichita wouldn’t have. What I’d find comfortingly familiar there, seems here to be part of the vast big city conspiracy just waiting to devour and doom the migrant from a distant, more innocent land. It happened to King Kong, it’s bound to happen to me too. Meet a blonde and next thing you know, it’s the biplanes. She gets a movie contract and you get a one-way ticket down a skyscraper. So although I’ve lived within a short distance of Jerry’s Diner for almost two decades, I have been there— like the title says— only about once every ten years. I think it’s enjoyed praise on LTHForum for its ham but somehow, whenever I try to think of some place to grab breakfast, Jeri’s has elicited a weaselly “Ennnh… some other time” in my inner dialogue. Finally I overcame this, or my inability to think of anywhere else on a solo Sunday morning did. I went into Jeri’s and sidled up to the counter, settling in amid the Algrenesque characters reading the Sun-Times (the paper of diner counters, no question) and eating the same thing they’d ordered every morning for more years than they could count. The paneling on the walls, in 60s orange and yellow stripes, summoned up some distant memory of a dance studio I’d gone to as a toddler for some kid’s birthday (Bucky Buchanan? Bill Wheeler?) Some of them conversed, making hard-luck jokes with the waitresses; others were determinedly introverted, noses down into their papers, not about to have a conversation that might reveal, obliquely, how the dreams and aspirations of youth had led to breakfast, alone, day after day at a 24-hour joint. One day they wouldn’t come in any more, and that would be that. I liked the atmosphere in all its down-at-heel urbanness. I could have enjoyed it all day with Frankie Machine on one side and Augie March on the other while Ed Hunter and his Uncle Am solved crimes in the background and Wanda Skutnik tried not to spill what she knew. The waitresses and counter man were genuinely warm and friendly, they made it a refuge in a harsh land. You could love Jeri’s… if it weren’t for the food. Alas, it was the cheapest, most industrial diner food imaginable. Flavorless rubber eggs. Pancakes from a box of Bisquick big enough to sleep in. Ham product that had the sponginess of reconstituted seatcover. There was probably a time when I could have eaten this just to enjoy the atmosphere. Today, it said to me, you don’t belong here. You with your ironic awareness of Edward Hopper and your foodsnob sensibility, you are not one of us, the fallen, the washed up. But who knows, maybe some day I will be. That’s always the promise of the city to the hopeful immigrant. Jerry’s used to be run by one of the greatest grillmen Chicago has ever known – Doug M. He made all the soups, gravies, double baked the hams and ran the grill on the third shift. Once he left (about three years ago) the place fell apart. A great loss indeed. Any idea where he went? I’ve been thinking about doing one about great old school grillmen. I do know. I have to find the address in my papers. I’ll look but I wouldn’t want to post it. He’s a very private guy.